(Text automatically translated) The house is located in Chianni &#39;ancient village homonymous village, located at the center of the Pisan hills, in the heart of Tuscany. Those who wish can enjoy the panoramic view of the place, can relax away from the deafening noise and smog, can take refuge in the small historic center, immersed in unspoilt nature and taste typical dishes of the area. Chianni can be a good starting point for tours of art, food, wine and nature. In all periods of the year Chianni is an ideal place for a holiday: in winter you can take advantage of the proximity to the ski resorts and spas, during the summer temperate climate leads to long walks between the green of the surrounding woods and a swim in the outdoor swimming pool. With a little luck you can observe the animals that live in protected areas for the repopulation of wildlife. This rental is very nice. The location, right in the town of Chiani is great. You can purchase most items needed from the local grocer, fresh pasta and sauces from a shop, or a espresso with the guys at the local bar by just walking a few blocks down town. The place is quiet, secure, and very clean. You need a car here, but with one you have easy access to most of Tuscany. Just outside of town there is a olive processing place you can purchase both fresh pork and fresh virgin olive oil that is very good.It is close to some good restaurants, a lot of great hill towns, and a good cooking class. The only drawback for us was that there is no WIFI and even that was not terrible as we could just go down to the bar a couple of blocks away and get an espresso and have free WIFI. The apartment has pretty much everything you need to cook, fix espresso, and catch up on your wash. We were happy to stay here for two weeks in Tuscany. Chianni is a village full of charm and seemed to be central to everything in Tuscany. They say all roads leads to Rome, well in Tuscany all roads lead to Chianni. The apartment was very clean and well equipped for cooking breakfast in the morning, well laid out with parking in the front. There is a small washing machine we used regularly with a cloths line outside to dry cloths. We arrived late at night and Laura's husband was waiting for us to ensure we found the place and found the key to open the doors, very nice. Laura the owner, came the next day after we arrived with a bottle of Tuscany wine, answered all our questions and made us feel welcome to her home. There is a great little coffee shop down the hill from our apartment that had a outdoor TV airing the football game a few nights a week (great place to have a drink and relax), a few grocery stores to buy food and 2 very nice restaurants with in walking distance to enjoy fine dining in the evenings. From Chianni we traveled to Pisa, Florence, Livorno, Cecina, Pondetera, visited the village of Lajatico (The Theater of Silence) were Andrea Bolceli is from and many fascinating little villages in Tuscany. We stopped at many wineries participating in wine tasting, spent an afternoon in a cooking class with a professional Italian chef learning how to make pasta, risotto and a chocolate dessert. Each location was a day trip and returning home to Chianni was very easy and enjoyable drive we loved doing..
After a few days we were comfortable with driving the roads and even tried to get lost, but seemed we always found a sign directing us back to Chianni, of course we had GPS in case got lost. Chianni is a wonderful mountain village to walk, lots of hills, beautiful views of the farmland below. 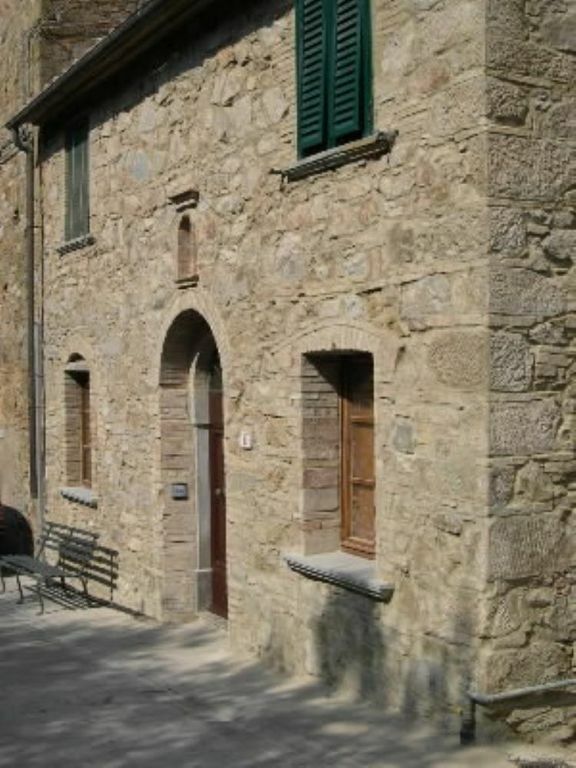 We love the apartment, perfect location situated in the heart of Tuscany, easy access to major roads. A place my wife and I will come back to. Thank you Laura for your help and letting us rent your place. kleine, sparsam eingerichtete Wohnung aber mit allem Wesentlichen für den normalen Alltag. Sehr hilfreich ist auch die Waschmaschine, die ohne zusätzliche Kosten genutzt werden kann. Handtücher und Bettwäsche waren ebenfalls vorhanden, gegen einen geringen Aufpreis. Sehr nette Vermieterin - wir wurden gleich bei der Ankunft mit einem Korb Weintrauben aus ihrem Garten empfangen. Absolut unkompliziert und hilfsbereit. Die Betten waren etwas gewöhnungsbedürftig, besonders das Bett für die Kinder, eigentlich ein Sofa, war sehr hart und unbequem. Ansonsten ein schönes Örtchen mit vielen kleinen Läden in denen man alles bekommt was man so braucht. Für größere Einkäufe gibt es einen großen Supermarkt in etwa 10km Entfernung. Wir waren sehr zufrieden - sicherlich geht es auch exklusiver, wir haben jedoch etwas preiswertes und schlichtes gesucht - und gefunden, da wir ohnehin tagsüber unterwegs waren. Wir haben eine wunderschöne Woche in dieser Ferienwohnung in Chianni verbracht. Wir sind mit zwei Kindern angereist. Die Kinder hatten die Möglichkeit auf der sehr ruhigen Straße und dem Park etwas oberhalb des Hauses zu spielen. Der Ort Chianni ist sehr schön und recht mittig gelegen, so dass man Pisa, Lucca, Siena, Florenz, San Gimignano oder auch Volterra sehr gut erreichen kann. In ca. 40 min. ist man auch am Meer. Wir haben es geschafft in einer Woche alles zu bereisen und hatten auch dank der tollen Unterkunft einen sehr schönen Urlaub. Die Gastgeberin Laura ist sehr freundlich! Man fühlt sich wie Zuhause! Molto Grazie Signora Laura! Chianni liegt im Dreieck Florenz, Siena, Pisa. Von hier aus kann man die Toskana sternförmig sehr gut erkunden. Die Ferienwohnung ist geräumig und gut ausgestattet, so dass man bei schlechten Wetter auch mal einen Tag in der Wohnung verweilen kann. Einziger Nachteil ist, dass es weder Garten, Terrasse oder Balkon gibt. So könnte man auch an schönen Tagen einfach relaxen ohne irgendwohin zu müssen. Es gibt zwar einen kleinen Garten an der Rückseite des Hauses, aber leider wird er nicht gepflegt und ist gesperrt. Der kleine Park, etwas bergauf auf der anderen Straßenseite ist meist bis Mitternacht fest in der Hand der dort ansässigen Jugend. Da das Schlafzimmer zur Straßenseite liegt, ist ein ruhiger Schlaf nicht immer gegeben. se cè stato questo disagio mi dispiace , per la prossima estate prenderemo provvedimenti. The apartment is nice and cozy but not in the garden as it does not appear in the description of the apartment. The small plot of land on the side of the house that is not cared for is unfortunately not ours. Die Wohnung ist in einem toskanischen Landhaus, schön eingerichtet, wie abgebildet und beschrieben. Das Haus liegt mitten in Chianni, einem schönen typischen toskanischen Dorf, das ein guter Ausgangspunkt für Ausflüge nach Volterra, Siena, San Gimignano oder zum Strand ist. In Chianni selbst gibt es auch noch ein Schwimmbad, das wir sehr empfehlen können, auch die Führung durch Chianni (montags morgens). Wir haben die Zeit sehr genossen. IDEALE PER VISITARE CITTà D'ARTE A30 KM DAL MARE . (Text automatically translated) Chianni is reachable from Florence in just over an hour taking the highway FI-PI-LI direction Pisa / Livorno up to Pontedera then along the road that leads to the Rose Terricciola where it meets the indication for Chianni . Chianni is reachable from Pisa in forty minutes, taking the highway FI-PI-LI towards Florence until Ponsacco: then along the road that leads to Casciana where it meets the indication for Chianni. (Text automatically translated) EVENTS In the second and third week of February you can taste and buy the OIL FESTIVAL extra virgin olive oil crushed using the place with the oldest methods in the local mills. The second and third week of October the tasty brown derived from local chestnut trees are purchased at the FESTIVAL OF BROWN Rivalto. In the first two weeks of November, held at the famous Chianni WILD BOAR FESTIVAL where, in addition to dishes made of wild boar (wild boar stew with olives, pappardelle with wild boar ...) it is possible to taste other specialties such as locally produced the extra virgin olive oil, wine and mushrooms. The last Sunday in June THE SFERRAGLIATA round of the Italian rubber. From 15 June to 30 August meeting at GROVE (where Andrea Bocelli sang often before he became famous) for dances and dinners.